Hello again and thank you for joining me for this fourth edition of Lesley’s blog, “Annabel Lee”. The powers that be have declared that the colour of Thursday is blue. Accordingly I shall show you a blue beaded, appliqued and embroidered wristlet which I am working on. I am deliberating on how to do the actual lacy cuff bit. A detail of the wristlet-so-far is shown here with some beaded teapot & cup ornaments. I just cannot decide what to use for the actual lacy cuff bit of the wristlet. My sewing assistant and I have hauled out the masses of white lace which I inherited from my grandmother and mother and have happily dumped it all on the craftroom floor. We sit in the pile, dig around, take out a few bits, try them out against the wristlet-so-far, look at them with out heads on the side for a bit, throw them back and bundle them all away again until the next time. I just can’t decide. I’ve seen lacy sets made from the collars and cuffs of old shirts. I’d like to try that too one day when I am more decisive. Finally, our Tarot for the day. I have had Elvis Costello’s “Accidents Will Happen” as an earworm all day, so I chose the Wheel of Fortune as our card. Rumination and the singing of the song drew me to The Moon. Ah! 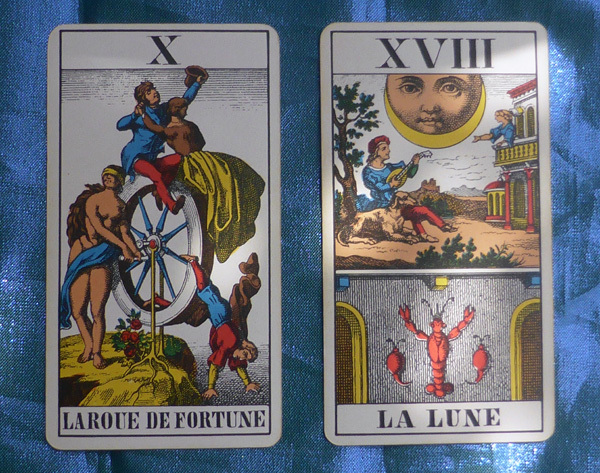 Two Major Arcana. A clear warning this Thursday against deception and an admonition to accept change today. It may be that things are not going as you planned but you should go with the flow. Don’t fight it.